The holiday season is upon us, and I have mountains of early Black Friday ads filling my mailbox and inbox to prove it. I love a good deal, but this year I&apos;m going to hit the snooze button, make a leftover turkey sandwich and conserve some shopping energy for Small Business Saturday on Nov. 28. More than a dozen small businesses in Brownsburg will celebrate Small Business Saturday with a passport event that begins with a kickoff breakfast at Sarah&apos;s Sweets, 729 N. Green St.
Fourteen locally owned Brownsburg businesses will participate and shoppers who get a punch or stamp on their passport at each participating business will be entered to win a basket of merchandise and gift certificates. Visit Sarah&apos;s Sweets between 8 and 10 a.m. on Nov. 28 to get a passport and more information including names and addresses of all the businesses participating. If that wasn&apos;t enough, Visit Hendricks County recently announced its online Holiday Gift Guide featuring One-of-a-Kind Finds from locally owned stores throughout the county. Check out these ideas for the men, women, teens, kids and even the foodies on your list. But you don&apos;t need an event or even a holiday gift guide to shop local this year. Hendricks County has some amazing small businesses that offer a variety of both popular and unique gifts. To prove it, I felt like I needed to do my part. So, in honor of Small Business Saturday, I chose to put in the work for you by shopping at a few of these stores I had not personally visited. As you read about what I discovered, remember there are plenty more of these locations waiting for you to discover. So I implore you to shop local this holiday season. You might be surprised with what you find. One of the locations featured on the Small Business Saturday passport promotion in Brownsburg, I can&apos;t understand why in the world I had never been to Wilbur&apos;s before. It was like finding gold. The store looks quaint from the outside, but step inside, and you&apos;ll find a treasure trove of all the popular toys, games and crafts you&apos;re looking for. You&apos;ll even find some items you didn&apos;t know existed. I spent an hour talking with the staff, taking some pictures and...uh...shopping. I was surprised by the selection and even more by their great prices. As a mom, I&apos;ve come to love certain brands because of their durability, vibrant colors and true function. 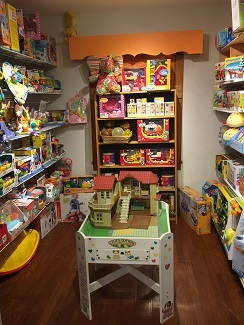 At Wilbur&apos;s Lincolnwood Toy Store, I found all those brands, such as Lego, Melissa and Doug, Calico Critters and more but with a bigger selection than what I&apos;ve found at most chain stores. Stop by Lincolnwood Toy Store, 285 W. Main St., Brownsburg, to see all they have to offer and grab a coupon from the friendly staff. They are giving away a FREE gift to those that shop with them on Small Business Saturday, Nov. 28th. Store hours are Mon.-Fri. 10 a.m.-5 p.m. and Saturdays from 9 a.m.-5 p.m. I probably shouldn&apos;t have stopped by this gorgeous store as I left with a rather lengthy wish list of my own. In the past, I&apos;ve only visited Country Harmony during the summer months and never ventured past the plants and flowers. I&apos;ve been missing out. 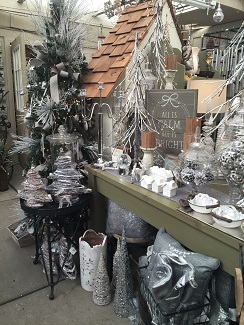 Country Harmony, 721 N Green St., Brownsburg, is the kind of store you could easily spend an hour just walking around looking at all their displays. It also is part of Brownsburg&apos;s Small Business Saturday event. If you&apos;re not familiar with this local gem, let me explain. If you&apos;ve ever looked at a beautifully decorated home on the cover of a magazine or on Pinterest and wondered, Where do they get the decor and furnishings? The answer to your question is Country Harmony. Obviously, I found plenty of items I wanted for myself, but they offer a host of items that would be really great gifts. Wood art, candles, gourmet food, kitchen items, boutique style decor and furnishings, yard decor, seasonal plants, pillows, rugs and every trinket or trimming you could hope for. I ended up finding a few unique items for my Thanksgiving table and a beautiful, vibrant printed kitchen towel from the summer clearance section. I didn&apos;t want to get too much on my first visit because I plan to go back on Small Business Saturday. Also, I wasn&apos;t shopping, I was working. Remember? Fall business hours are Monday-Saturday from 9 a.m.-8 p.m. and Sundays from 10 a.m.-5 p.m. Be sure to shop on Small Business Saturday for special discounts. 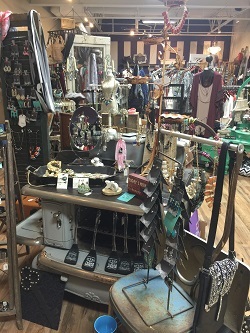 Don&apos;t let the store&apos;s description of "women&apos;s resale boutique" fool you, they offer a variety of items - perfect for gift giving. 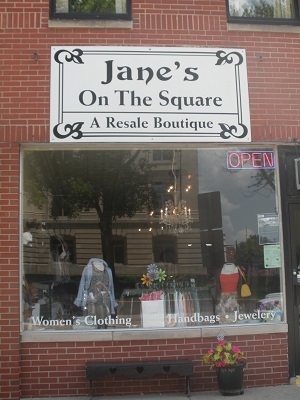 In addition to the wide selection of clothing, Jane&apos;s also has decorations, accessories, purses, shoes and jewelry. The best part is, the selection is always changing. Millie&apos;s Jewelry is a popular line of handmade, vibrant, unique jewelry made from recycled soda pop cans. These pieces make great gifts and they&apos;re only $5 - and it&apos;s for a good cause. Read more here. The owner will host an open house on Small Business Saturday, where you can take advantage of special offers and shop new items that she has been waiting to get out on the racks. 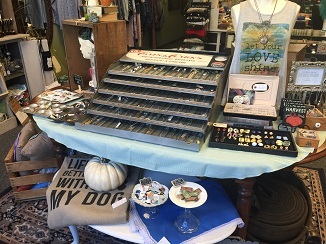 Jane&apos;s on the Square is located at 65 W Marion St., Danville, and is open Tuesday-Friday 11 a.m.-6 p.m. and Saturdays from 11 a.m.-4 p.m.
You never know what you&apos;ll find at Jane&apos;s, but chances are, you&apos;ll find something for someone. Numerous items from this fun shop were featured in the Gift Guide, so I decided I should probably go see for myself. We&apos;re still calling this work, don&apos;t forget. I had my two youngest kiddos in tow, and both found several pieces they wanted to get for their teachers or friends. Seize the Night has a fantastic selection of jewelry - rings, necklaces, bracelets and cuffs. Most of the non-custom items I looked at were under $15. I adore these small, vintage inspired necklaces with typewriter print initials. Oh boy, add another item to my wishlist. The owner showed me some of her more popular items and pointed out those items that can be customized. Her jewelry is gorgeous and the custom option makes these pieces that much more personal. I really liked a simple, silver tree ornament that can be personalized. In addition to the jewelry and custom pieces at Seize the Night, you&apos;ll find flannels, shoes, essential oils, home decor, dish towels, stationary, headbands and scarves. The owner will be at a trade show on Small Business Saturday and will not open the shop at 51 W Marion St., Danville until 6 p.m. The good news is, she is offering a 10% off total purchase (excludes custom items, flannels and shoes) all this week. Plus, receive a FREE canvas bag when you spend $30 or more. If you&apos;re in Danville for Christmas on the Square, Friday, Nov. 27, stop in and take a look around this adorable shop. I already know what I&apos;m going back for next week - and I&apos;ll also take advantage of the FREE gift wrapping that they offer year-around. I&apos;ve followed this boutique on social media for months and have said that I&apos;m going to stop in for just as long. My daughter and I finally made our way to 2481 E. Main St., Suite 170 in Plainfield, the other night. Despite all that anticipation, I was not disappointed. The boutique itself is super cute. I really appreciate the work and design that goes into creating a space like Younique Culture. It&apos;s inviting, makes me feel like I can relax and take my time looking at everything - not just run an errand. So, that&apos;s what we did. We hung out in that awesome space and looked at everything. Twice. Younique Culture offers all the latest trends in fashion for women (including plus-size) and men. Clothing items include, but certainly aren&apos;t limited to: flannels, jeans, tees, leggings, dresses, tunics, and sweaters. Their men&apos;s section is fairly new, but you wouldn&apos;t know it. You&apos;ll find lots of great gifts for the guys on your list here. They carry brands such as Lucky Brand, United State of Indiana and Good hYOUman, as well as a host of other brands. You&apos;re sure to find a new favorite. Mackenzie, the owner, told me that they go to great lengths to offer and support as many local brands as possible. You&apos;ll find a wealth of local brands in the store, and the selection is always changing and growing. 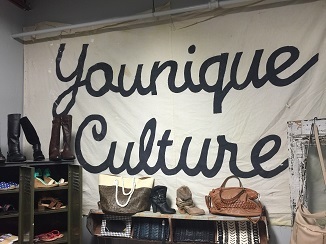 Younique also offers an abundant variety of home decor, handbags, wallets, jewelry, scarves, hats, socks and some really great shoes and boots -- all at great prices. My daughter saw several things that she swears she&apos;s been looking for forever. At least someone appreciates my tireless research. I almost forgot to mention that they also carry the Indiana-based company, Ambre - a line of amazing essence fragrance, lotions and serums. These four "scents" are heavenly. You&apos;ll want to stop in on Small Business Saturday, too. The entire store is 25% off, 50% off clearance AND they&apos;ll have a raffle. For every purchase, you can enter your name for a chance to win a gift card. Younique Culture will open early on Small Business Saturday, you can shop from 10 a.m.-7 p.m. Normal winter hours are Monday-Saturday from 11 a.m.-6 p.m. and Sundays noon-5 p.m. Check out their website here or call (317) 675-0062 for item availability or store information. Small Business Saturday on Nov. 28 is a great day to shop at both new and familiar local stores. Get great deals, unique gifts of all kinds, and support our small businesses. I would try to call my shopping on Small Business Saturday another part of the job, but who am I kidding?